Artist Aloud launches ‘Happy Club’, India’s First Digital Open Mic – A Pan-India Multi-Lingual Digital Comedy Talent Hunt. 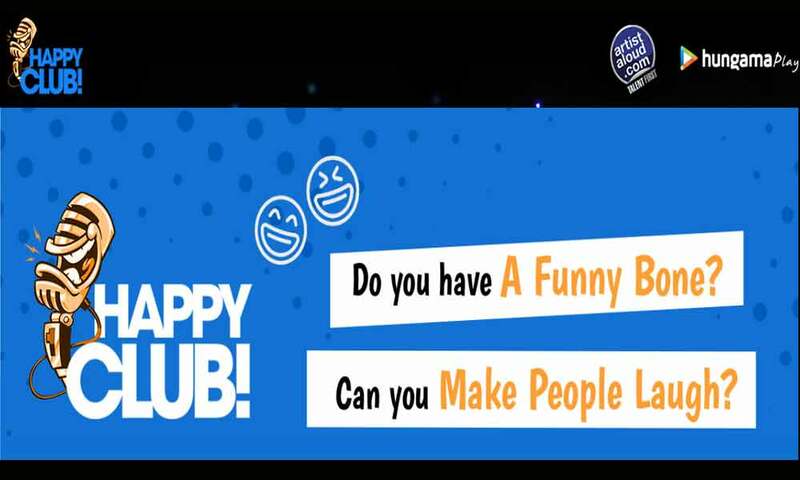 Artist Aloud announces ‘Happy Club’, a digital talent hunt for budding comedians across India. The talent hunt seeks to discover comic talent across English, Hindi, Marathi, Gujarati, Tamil, Bengali and Punjabi, giving a chance for fair representation and participation to all individuals adept in either of the 7 languages. Language-specific winners will be chosen by a jury comprising renowned comedians– Rajiv Thakur (Hindi), Nitin Mirani (English), Jaswant Singh (Punjabi), Manan Desai (Gujarati), Sumedh Shindey (Marathi), Mervyn Rozario (Tamil) and Anirban Bhattacharya (Bengali). The talent hunt provides a unique opportunity to all winners to shoot a digital special each that will be available to stream on Hungama Play and Artist Aloud. Aspiring candidates can participate in the contest by following 4 simple steps – downloading the Artist Aloud app on Google Play store, recording a funny performance of themselves in either of the 7 languages, uploading it using the app and finally, sharing it with their friends and family asking them to vote. All candidates would be required to upload their videos by 10th November 2018, while public voting will remain active till 19th November 2018. The jury round will be conducted on 20th November 2018 with the winners being declared on 23rd November 2018. As a part of the talent hunt, Artist Aloud is also working with ATKT.in, a digital platform that seeks to promote original content created by college students, to find comic talent in each of the 7 languages at a collegian level as well.